As if that weren't enough her husband's company threatened a transfer. Then her sister, whose holiday visit she coveted, called saying she could not come. What's worse, Sandra's friend infuriated her by suggesting her grief was a God-given path to maturity that would allow her to empathize with others who suffer. "Had she lost a child? No--she has no idea what I'm feeling,"
Sandra shuddered. Thanksgiving? "Thankful for what?" she wondered. For a careless driver whose truck was hardly scratched when he rear-ended her? For an airbag that saved her life but took that of her child? Sandra regretted her outburst but was surprised when Jenny said, "I have the perfect arrangement for you." The door's small bell suddenly rang. "Barbara! Hi," Jenny said. She politely excused herself from Sandra and walked toward a small workroom. She quickly reappeared carrying a massive arrangement of greenery, bows, and long-stemmed thorny roses. Only, the ends of the rose stems were neatly snipped, no flowers. Sandra gasped. "A friend read that passage to me and I was furious! I guess the truth is I don't want comfort. I've lost a baby and I'm angry with God." She started to ask Jenny to "go on" when the door's bell diverted their attention. "Hey, Phil!" shouted Jenny as a balding, rotund man entered the shop. She softly touched Sandra's arm and moved to welcome him. He tucked her under his side for a warm hug. "In fact, I'm glad you asked," he said. "Four years ago my wife and I nearly divorced. After forty years, we were in a real mess, but we slogged through, problem by rotten problem. We rescued our marriage--our love, really. Last year at Thanksgiving I stopped in here for flowers. I must have mentioned surviving a tough process because Jenny told me that for a long time she kept a vase of rose stems--stems!-as a reminder of what she learned from "thorny" times. That was good enough for me. I took home stems. My wife and I decided to label each one for a specific thorny situation and give thanks for what the problem taught us. I'm pretty sure this stem review is becoming a tradition." "Nothing. Nothing but a pledge to work toward healing your heart. The first year's arrangement is always on me." Jenny handed a card to Sandra. "I'll attach a card like this to your arrangement but maybe you'd like to read it first. Go ahead, read it. 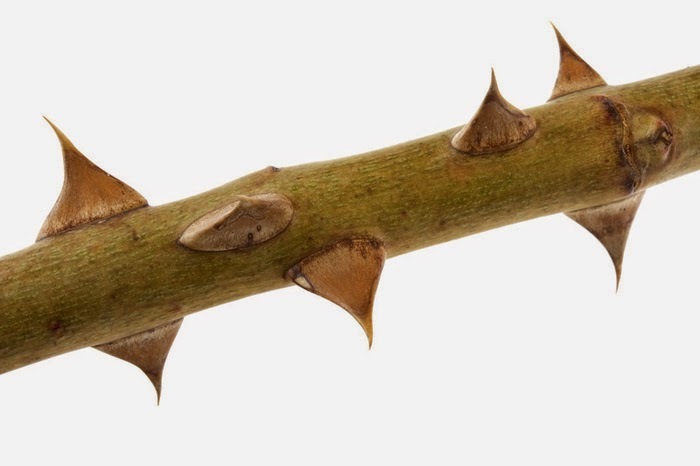 "My God, I have never thanked Thee for my thorn! 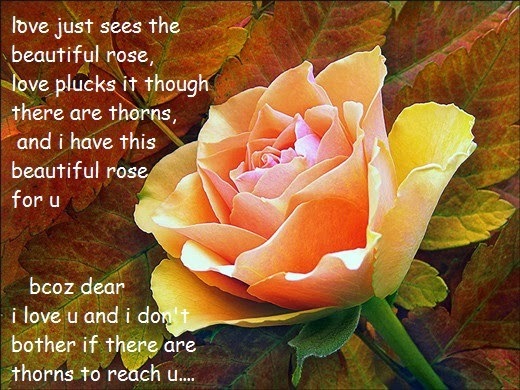 I have thanked Thee a thousand times for my roses, but never once for my thorn. Teach me the glory of the cross I bear, teach me the value of my thorns. Show me that I have climbed to Thee by the path of pain. Show me that my tears have made my rainbow.--George Matheson"
Jenny said, "Happy Thanksgiving, Sandra," handing her the Special. "I look forward to our knowing each other better." Sandra smiled. She turned, opened the door, and walked toward hope.